Would you like to tell us about your experience with hospitals over the last few years? My experience with hospitals and polyclinics is rather long and it’s been pretty rough in the last weeks. The streak of bad luck began when I fell from a scaffolding when I was painting my house the first week of this year. I fractured the tibia and fibula of the right leg. The doctors told me right away that I should get ready for a three-months immobilization and they put my leg in a plaster cast stretching from the foot to the groin. But Cuba offers free health care, so you didn’t pay anything for the consultations, for the ambulance or for the treatments, right? Well, it’s supposed to be free, but the reality is different. The accident happened late in the afternoon and before I was able to reach the orthopaedic hospital of Fructuoso Rodríguez, it was almost midnight. I couldn’t get a taxi or an ambulance but in the end, we managed to find a “cinco cinco”, a State-operated taxi which owes its name to the phone number of the service (“cinco cinco” is “five five” in English). The taxi took us to the hospital for the 5 CUC that my brother Andrés offered to pay. At dawn, after my leg has been put in a plaster cast, we were told to go back home and were referred to another hospital the next day, where they would decide whether I needed an operation. Were you taken home by ambulance? Although there were some ambulance cars, the drivers did not seem to pay any attention to the doctor’s referral; we ended up bargaining with them and managed to persuade them to take us home for another 5 CUC. Lying on a stretcher, I was attended really well as the whole family travelled with me. Is it common to charge patients in difficult situations? It is. I remember one morning in the hospital of Freyre de Andrade, former emergency department, when the doctor on duty, Ignacio Linares, suggested that we take our daddy who was in the terminal stage of senile dementia back home, because there was nothing they could do to help him. One day, during the last round of consultations, he was referred for X-ray but there were no stretchers available. Distressed, I finally found one at the entrance to the emergency department, but it was formally forbidden to take it from there. Only the “mandatory” tip of 1 CUC helped me to persuade the ward nurse, let’s call him “Molina”, to use the stretcher and take my daddy to the X-ray room. The same thing happened to me at Calixto García on a carnival Saturday in Havana several years ago. I will never forget the young man bearing the stretcher who helped me get out of the car. Would you believe that they refused to take an X-ray of my injured leg? The girl in the emergency room explained that X-ray examination was done in serious cases only. The stretcher-bearer, on the other hand, did help me at last, placing the splints as if he was an expert. He didn’t leave me until I got back in the car. This boy did indeed deserve the money he was earning. What other things did you have to pay for after that? After a few days, I was prescribed a physiotherapy treatment. I had to pay 50 Cuban pesos (CUP), which are some 2 CUC depending on the exchange rate, to be able to use the medical gym where I did some exercises and received electrotherapy. In the end, I decided to hire (privately) a physiotherapist who was willing to give me the therapy at my home. I paid her a thousand pesos but I saved the total of 500 CUP on the entrance fee, I was spared of waiting in the polyclinic, I didn’t have to buy the occasional snacks to the health staff anymore and I also avoided some other expenses, which – though little, always add up. Is the quality of medical consultations good? 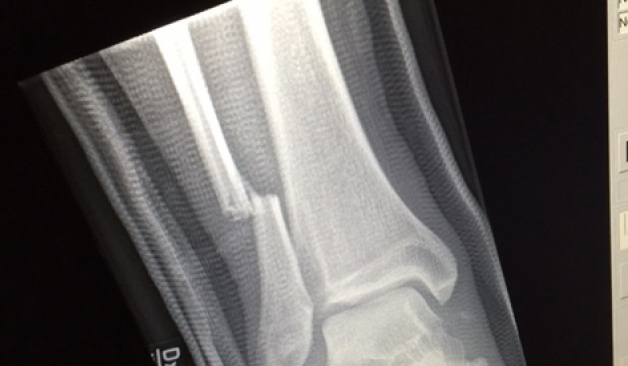 As concerns the fracture, the first diagnosis was correct. However, the doctors failed to identify the ruptures in the ligaments around the knee, of which I learned later, when a friend of mine helped me get another consultation. Do you want to share some other experience that would reflect the quality of healthcare services in Cuba today? I do. I’ll tell you about an event that happened last year. Actually, it has nothing to do with human health, but it shows the way hospitals work here. My neighbour Carmen Patricia came to see me the other day, full of anguish as her dog had been run over. The veterinarian demanded an X-ray, which could be done in the emergency department of the hospital. I won’t disclose the name of the technician at the hospital who agreed to circumvent the rules of the department for 10 CUC which Carmen Patricia paid him for taking the X-ray of her dog. The hospital is intended for human patients only, so they had to hide the animal in a large bag and smuggle it in. As soon as they obtained the X-ray, Carmen Patricia rushed back with it to the dogs’ clinic. What is the last thing you would like to say in our interview? Any conclusion? Right now, I’m waiting for an operation to straighten my right leg. The amounts keep adding up and I would be much better off if the State paid me a decent salary, not the miserable 500 pesos we get. Having to cover so many costs accompanying this free health care is troublesome and you never know in advance what the final amount will be.